Travel brands have an incredible amount of choice when it comes to setting up Pinterest boards. As a platform, Pinterest is so beneficial to the tourism industry because it encourages the dreaming, planning and sharing phases of travel planning -through images. 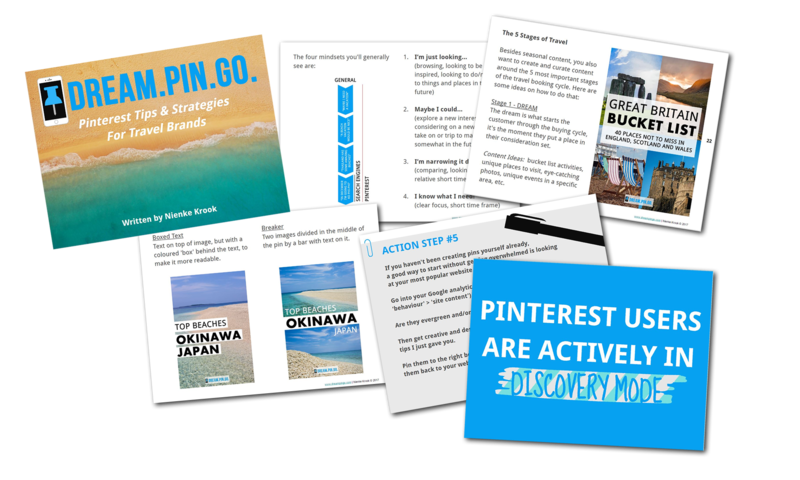 Did you know that there are more than 750 million destination pins on Pinterest already? The key to getting more travellers from Pinterest to your website is, besides creating unique and original content, setting up very specific Pinterest boards that show exactly the type of content your audience is looking for. If you need some ideas on exactly what kind of boards you should think of, this post will help you get started. And there is even a little gift for you at the end, so keep reading! Success on Pinterest largely depends on the quality and amount of great content on your own website. Having a regular updated blog or, for example, re-purposed content from your (in-flight) magazine, is a good resource for creating fresh pins. If your company is based on or in a specific destination like a country, region or (part of) a town or city, it’s advisable to show this on your Pinterest account. Make sure to narrow down the topics of these Pinterest boards, but still keep them broad enough so you are able to provide them with enough (curated) content in the long run. There are a thousand different reasons for people to go on a trip, so it’s important to do some research on who your own target audience is. What is the set-up of their travelling party (family, couple, solo…?) What is the reason for them to take the trip (honeymoon, friends weekend, health retreat…?) think about who you’re trying to reach with your business and answer their questions and needs in a board specifically for them. Pinterest is a place where people actively search for things they would like to have, make or do in the future. So-called ‘bucket-list’ items (activities that a person would like to do before they ‘kick the bucket’) are a very popular theme on Pinterest and your brand can play into this nicely by showcasing the unique, not-to-miss experiences that travellers can have in your destination or during the use of your product/service. Examples: Intrepid Travel: Iconic & Tourism Ireland: Ireland Must-See & Visit Malta UK: Malta Bucket List & The Ranch at Rock Creek: Bucket List Travel & HostelBookers: I want to do that! Travelling like a local has never been as popular as today. Showcase the experiences visitors can have that are a bit off the tourist tracks, point them to amazing local businesses and attractions and also let the locals share their own tips on what they love about the location they are in that they feel visitors might also enjoy. In addition to planning itineraries and the individual activities that travellers would like to do on their next trip, Pinterest users are also actively searching for practical advice that helps them with the preparation or execution of their travels. Where can your brand tune into this need? It can be with your own products, but also with curated content that can be beneficial to your audience. A picture says more than a thousand words and with Pinterest being such a visual platform, there is not better place to showcase the most beautiful photos of landscapes, but also perhaps of local wildlife, people’s portraits, architecture or other eye-catching images of topics related to your business. If you cover a specific destination with your travel business, there are sure to be different sights and activities around the year that are interesting for visitors. When you give them their own board, you can move current themes to the top of your Pinterest boards, while out-of-season content can be moved down. While most content on Pinterest is evergreen and can be found and used over and over again, adding some timely content like deals, promotions, giveaways or contests can definitely be beneficial. Just always make sure you never delete the landing page on your website, because Pinterest pins have a long lifespan and visitors that arrive through that timely pin on your website need to be informed or at least redirected on what to do next to prevent them from leaving your site right away. Pinterest has a high amount of lifestyle-related content that’s being uploaded daily, but just because you’re a travel business doesn’t mean that you cannot incorporate some lifestyle content yourself. Think about food, drinks, clothing, (interior) design, books, hobbies, shopping, beauty… which of these themes could you give a spin to fit in with your brand message? Only your own creativity is the limit here! Looking for more suggestions on travel-themed Pinterest boards for your account? No worries! Download my free ebook today and you’ll receive over 200(!) suggestions for Pinterest boards that will suit your travel brand. Posted in best travel sites, blog, pinterest marketing, pinterest strategy, tourism marketingBookmark the permalink.